Fold the paper concertina-wise 4-5 times. 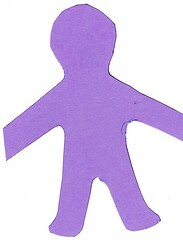 Draw the outline of a person on the front piece of paper, making sure the arms reach to the folded side edges, the head reaches the top and the feet reach the bottom. Cut the person out, cutting through all thicknesses, making sure they stay connected at the ends of the arms. Open the folded paper out and decorate the string of people as desired.